An Internet entrepreneur best known as the co-founder of Zynga, which makes online social games, he also founded Freeloader, Inc., Tribe Networks, and SupportSoft. 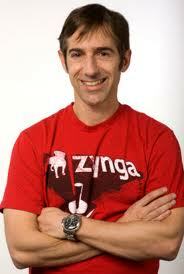 He currently serves as CEO of Zynga, which has 235 million monthly active users as of May 2010. In 2009, he was named “CEO of the Year” at The Crunchies, and in the same month was named Founder of the Year for 2010. Born in Chicago, he holds a Bachelors of Science in Economics from the Wharton School of the University of Pennsylvania and an MBA from Harvard Business School. Before he became an entrepreneur, he worked in venture capital and financial services for six years. He spent two years as a financial analyst for Lazard Freres & Co. after graduating from Wharton. After that, he moved to Hong Kong where he served as a vice president for Asian Capital Partners for two years. He returned to the States to attend business school and spent a summer as an associate for Bain & Co. in 1992. After he graduated from Harvard Business School, he took a job as a manager of corporate development at Tele-Communications, Inc.; now AT&T Cable. A year later, he joined Columbia Capital as a vice president where he led investments in new media and software startups for a year in Washington, DC. In 1995, he launched his first startup, Freeloader, Inc., a web-based push technology service that was acquired seven months later by Individual, Inc. for $38 million. He started his second company, Support.com, in August 1997. As chairman and CEO, he built the company into a leading provider for service and support automation software. The company went public in July 2000 and in 2002, changed its name from Support.com to SupportSoft, Inc. In 2003, at age 37, he founded his third startup, Tribe.net, which partnered with major local newspapers and was backed by The Washington Post, Knight Ridder Digital, and Mayfield Fund. In 2007, Cisco Systems acquired the core technology assets of Tribe.net to develop a social networking platform for its digital media services group. In 2003, he and Reid Hoffman purchased a broad sweeping patent that describes a social network service that is the heart of social networks from the extinct sixdegrees company for $700,000. He cofounded his fourth company, Zynga Inc., in July 2007 and currently serves as the CEO. Zynga is named for his late American Bulldog, Zinga, which claims to be "committed to transforming the world through virtual social goods". The early supporting team included Kyle Stewart, Scott Dale and John Doerr. Zynga develops social games played on various social networks including Facebook, as well as on mobile devices including the Android, iPhone and iPad. Zynga currently boasts over 250 million monthly active users across its network of games which include CityVille, FarmVille, FrontierVille, Mafia Wars, Zynga Poker, Café World, Treasure Isle, YoVille, FishVille and PetVille. In addition to making their own games, Zynga has created a network which allows third party developers to become part of the Zynga network. Zynga claims to be the largest social game network on the web. In a video posted November 9, 2009, he said, "I did every horrible thing in the book too, just to get revenues right away. I mean we gave our users poker chips if they downloaded this Zwinky toolbar which was like, I don't know, I downloaded it once and couldn't get rid of it,". Zynga.org has raised more than $6 million for several international nonprofits. In January 2010, Zynga.org raised $1.5 million for Haiti Earthquake Relief. In September 2010, Zynga.org raised $500,000 in two days for L’Ecole de Choix, a K-12 school Zynga is building in Mirebalais, Haiti. In addition, in December 2010 Zynga raised over $800,000 for the UCSF Benioff Children’s Hospital, as part of the UCSF Challenge for the Children competition.